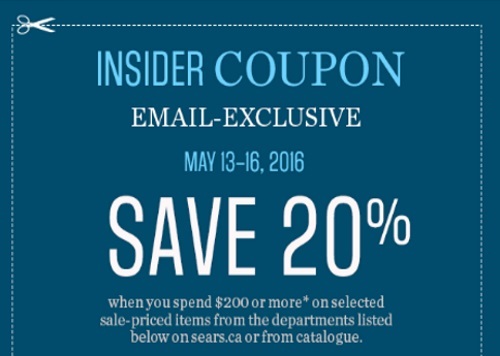 Sears has some new coupons available to their email subscribers. Coupon is valid on the following departments: Women's fashion, Men's fashion, jewellery and watches, accessories, luggage, footwear, kids and baby, toys, bath and bedding, decor and window, kitchen, mattresses, furniture, vacuums, electronics, heating and cooling, fitness and recreation sewing. Coupons are valid May 13-16, 2016 only.